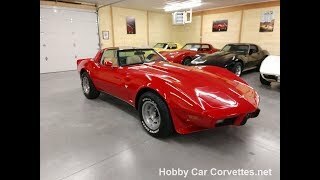 This little red corvette is a lot of fun to cruise around in. The 4 speed manual transmission mated to the L82/350 engine option is an awesome combo! With matching numbers and only 50,000 original miles, this vette won’t stick around here for long. GM only produced 14,516 L82’s, 12,321 with Gymkhana suspension, 6,853 with pace car spoilers, and only 12,353 4 speeds in 1979 out of 53,807 total production that year.